I'm Ruth Stubbs, the recently appointed national programme manager for the NHS Cervical Screening Programme (CSP). As you know from previous blogs, changes within PHE have seen all 11 NHS screening programmes brought together into a single screening division. The cervical, breast and bowel cancer screening programmes are now part of the division's young person and adult (YPA) programmes team that includes the diabetic eye and abdominal aortic aneurysm screening programmes. I've taken on the national programme manager role at an interesting and exciting time. Although cervical screening is well established, it faces a number of challenges, including IT and data systems that date back to 1988 when the programme was first introduced. The national statistical report, produced by our colleagues at the Health and Social Care Information Centre (HSCIC), details key statistics from across the cervical screening pathway. It’s a valuable report that demonstrates the programme’s strengths as well as areas for improvement. Pritpal Rayatt from the HSCIC will write a blog soon relating to the statistical report that summarises essential data from our screening programme. What is evident from both the above reports is that there has been a decline in coverage which continues to be a key concern in the programme. We're interested in finding out how we can get women to take up their screening invitation, improve coverage and reduce the number of women who develop cervical cancer. One of the main reasons for women declining screening is fear and embarrassment. That's why we're keen to explore evidence regarding HPV self-sampling techniques and we'll continue to look into this in 2016. The reports also underlines all the hard work that goes into delivering cervical screening. I'd like to take this opportunity to thank our wider team for all their efforts and I look forward to continuing to work with you in 2016 to produce the high quality screening that women deserve. Thank you for your comments. Self-screening kits are not currently approved for use within the English cervical screening programme. However, we intend to explore the evidence around HPV self-screening in order to consider a future proposal in the programme. The UK National Screening Committee has recommended that primary screening using HPV testing is introduced into the programme and this screening methodology would support self-testing. It is anticipated that the use of HPV primary screening will mean that women won’t need to be invited to attend screening as often as we will be able to extend the time between tests. Thank you again for reading our blog, and taking the time to comment on it. I would suggest that the main reason for the decline in cervical screening coverage is because women with good health literacy are doing research and discovering the truth about this programme. We were never given the true statistics, told about the significant harms or the huge rates of over treatment. The screening rates will continue to decline as more women discover the truth about this industry created around cervical cancer screening. I would suggest that many women are very angry and mistrustful now, particularly those who have damaged cervices. Time for transparency and INFORMED CONSENT. Discontinuing incentive payments to GPs is also necessary and would show that the NHS is cleaning up its act. Screening is a choice. We encourage all people who are offered screening to weigh up the potential benefits and harms before making an informed decision whether to accept the offer. Cervical screening aims to detect abnormalities within the cervix that could, if undetected and untreated, develop into cervical cancer. The incidence of cervical cancer has decreased significantly since the introduction of the cervical screening programme. In 2014 to 2015 the screening programme detected more than 31,000 cases of high grade abnormalities, more than 1,200 cases of glandular neoplasia and more than 600 cases with invasive carcinoma. 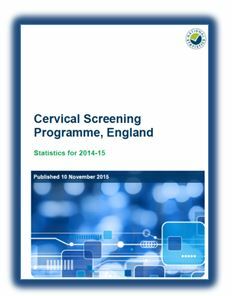 To find out more, please see the statistical report for the programme that details the latest results here: https://www.gov.uk/government/statistics/cervical-screening-programme-statistics-for-2014-to-2015.